Simpson is pictured with family, Mr. Jarnagin, members of the Grainger County School Board. 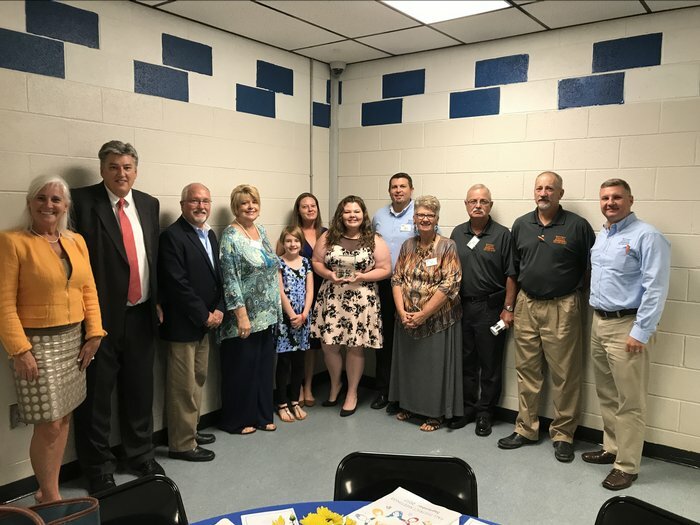 On Tuesday, September 19, Destiny Simpson, GHS Senior, was awarded the Tennessee School Board Association Student Recognition Award. She was very active in FCCLA Chapter 2 at Grainger High School, as well as, being enrolled in Walter State Community College dual enrollment courses. Destiny was determined to raise awareness of leukemia. She taught several classes and created a Jepordary game detailing information about the disease. Through her fundraiser, she was able to raise $2,000 and collect eight boxes full of toys, which was given to East Tennessee Children's Hospitial. Destiny was the first student at Grainger High School to receive this award, and from all of her accomplishments it is well deserved. Congratulations Destiny!